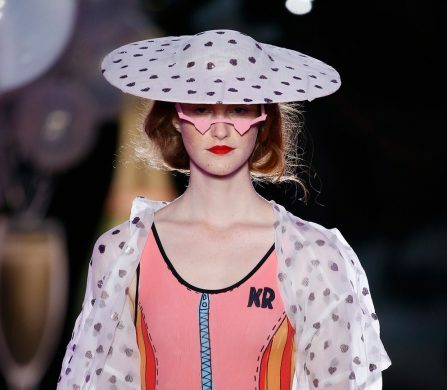 This summer, 080 Barcelona (Catalonia’s fashion week) celebrated its 20th edition in the stunning setting of Recinte Modernista Sant Pau, a historic hospital, with colourful Mediaeval-turned-Art Nouveau architecture. From 26th to 30th June, around 31,000 visitors descended on the picturesque location to watch 37 designers and brands show their spring/summer 2018 collections. Throughout the week, much anticipation was focused on who would walk away with the Government of Catalonia’s prestigious fashion awards. On the final day, the winners were at last announced, with the prize for Best Collection going to Elena Estaun. Primarily known as a jewellery designer, Estaun studied at Parson’s in New York and Central St. Martin’s in London and takes her inspiration from everyday objects, such as nuts and bolts, fossils and old keys. For her winning collection, Ethnic Vibes, she merged jewellery into clothing, thereby marking her debut as a fashion designer – clearly with great success. The Barcelona-born young designer started out as a tennis player, but her family’s leather tanning tradition brought her back to fashion. After studying in Milan at Instituto Marangoni and Instituto Secolo, Fontanelias returned to Igualada in Barcelona to open an atelier where leather plays a key role. The winning collection took inspiration from diverse sources, from fantasy and futurism, 1920s flappers and 1960s architecture to cinema and motor sport. 080 Barcelona is not just about creativity and catwalks. It also firmly focuses on the business of fashion. This is demonstrated in the inclusion of the Fashion Showroom, a collaboration with the Catalan Fashion Cluster (Modacc). Now in its fourth edition, the space provided a platform for business meetings and trade deals between 27 brands and 80 national and international buyers. Modacc, which is a non-profit organisation promoting fashion and textiles from the region, also presents an award, specifically for Exporting Brands. This season’s winner was menswear brand Torras, which has been producing leather and knitwear designs since 1951. 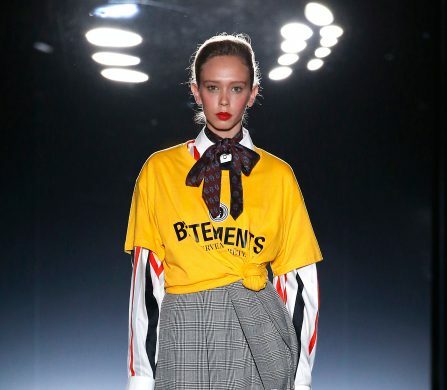 The collection, Beat Generation, was aptly inspired by the beatnik movement of the 1950s – think jazz, coffee and Jack Kerouac. Aside from the prize-winners, there was plenty more on offer from 080 Barcelona Fashion, including womenswear, menswear, childrenswear and, of course, lots of colourful Catalan swimwear. See our backstage coverage for further highlights.